What is DRaaS and why is it useful? DRaaS, also known as disaster recovery as a service, is the replication of hosting of physical or virtual servers by a third party to provide failover in the event of a man made or natural catastrophe. DRaaS can be especially useful to organizations that lack the necessary expertise to provision, configure, and test an effective disaster recovery plan (DRP). Millions of businesses around the world encounter some form of natural disaster. Imagine if a power outage, hardware failure, file corruption, human error, earthquake, flood, hurricane, thunderstorm, wildfire, winter weather, or tornado, strikes your data center. Major interruptions like your website going down or losing all your customer data will likely occur. In Ponemon Institute’s “Cost of Data Center Outages” study, it was reported that unplanned downtime costs organizations an average cost of $8,850 per minute. The Federal Emergency Management Agency (FEMA) reported that 43% of organizations affected by a natural disaster never reopen, and 29% of organizations affected close within two years of the occurrence. DRaaS focuses on a short recovery point objective. This means that the data restored will be as close to its current “now” state as possible. Typical recovery time objectives are within 4 hours and will bring up machines geographically located in a different location. For example, if your datacenter in Florida gets affected by a hurricane, DRaaS ensures your data will not be lost by switching to live mirrored servers in Nevada, which was not affected by the hurricane. What should you consider when choosing a DRaaS? Get a performance service level agreement (SLA) - Create a contract between you and your service provider to ensure pre-defined performance (i.e. 1 hour SLA guaranteeing your critical applications will be up and running within an hour). DRaaS costs are highly variable - Watch out for hidden fees (i.e. retrieval fees that charge per gigabyte which can substantially add up). Couple DRaaS with data protection - The cloud is an ideal place for long-term data retention because it’s isolated from production data and remote from ransomware. Pay for only what you use - Choose a provider that offers different DRaaS services for different classes of applications. Cloud seeding options - With cloud seeding, you can use physical media (i.e. tape, server, hard disks, etc.) to pre-load your data to the cloud and restore a failed local database. DRaaS can protect cloud applications - Deploy a backup appliance within the cloud and point your cloud applications to backup software in a different cloud facility than where your cloud applications are running. Include automated test recovery - You should have automated testing at least once a month and after any changes to the infrastructure to ensure your applications will really recovery. Advantages of purpose-built clouds - Purpose-built clouds have seamless integration between your backup appliances and the cloud, holistic support, and predictable recovery times. RackWare develops cloud management software that allows enterprises to migrate applications, provide disaster recovery and backup, and hybrid cloud management. Significantly improved support over traditional tape backup at a fraction of the cost required to maintain a replicated data center. Multiple recovery point objective (RPO) and recovery time objective (RTO) options that gives you control over availability and costs. You can ensure that critical applications recover quickly while secondary applications do so in the most cost-effective time frame. Pre-provisioned resources are launched in minutes to ensure a rapid RTO while auto recovery fallback ensures applications return to the primary data center for maximum performance. Delivers a truly heterogeneous approach, reducing multiple tools and helping users avoid lock-in of server vendor, hypervisor or cloud provider. Enables users to dynamically scale physical, virtual and cloud resources across private and public environments as computing needs fluctuate, allowing enterprises to get the highest performance and availability out of their cloud. Intelligently leverages cloud solutions for today’s applications. For more information regarding how DRaaS can help you, contact us. What is cloud disaster recovery and how does it work? 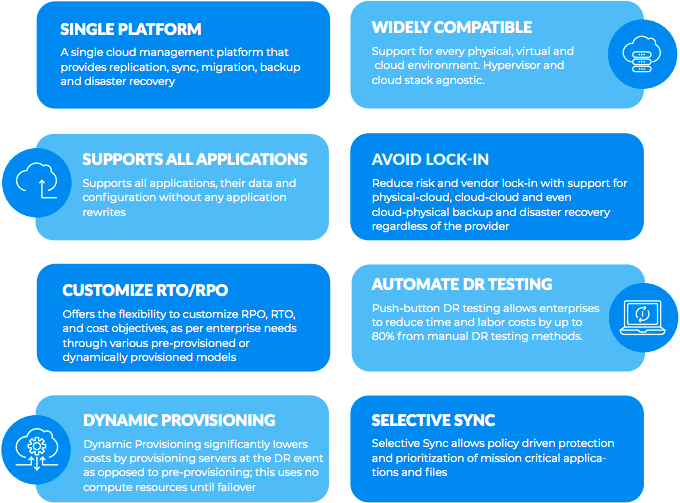 Cloud disaster recovery (CDR) is a cloud-based managed service that helps you quickly recover your organization’s critical systems after a disaster and provides you remote access to your systems in a secure virtual environment. When it comes to traditional DR, managing a secondary data center can be time consuming and costly. Cloud disaster recovery has changed everything when it comes to traditional DR by eliminating the need for traditional infrastructure and significantly reducing downtime. IT departments can now harness the power of the cloud for immediate spin-up and fail over. This creates faster recovery times at a fraction of the cost. How does cloud disaster recovery work? Cloud disaster recovery takes a very different approach than traditional DR. Instead of loading the servers with the OS and application software and patching to the last configuration used in production, cloud disaster recovery encapsulates the entire server, which includes the operating system, applications, patches, and data into a single software bundle or virtual server. The virtual server is then copied or backed up to an offsite data center or spun up on a virtual host in minutes. Since the virtual server is not dependent on hardware, the operating system, applications, patches, and data can be migrated from one data center to another much faster than traditional DR approaches. For more information regarding how cloud disaster recovery can help you, contact us.